AOBO 10011 - HANGZHOU AOBO TELECOM.,LTD. 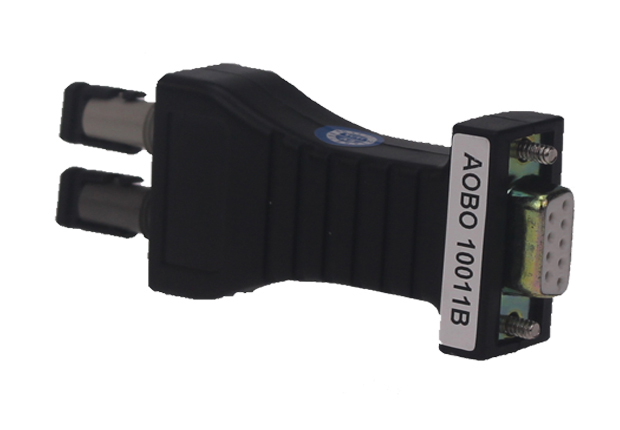 AOBO 10011 series converter is the extra small converter that supports the asynchronous RS-232 and optical fibre MODEM of the communication interface is the optimal solution for connecting the remote terminal unit (RTU) to the host or distributed data acquisition system (SCADA) controller. It supports the RS-232 asynchronous communication protocol. The RS-232 method employed by AOBO 10011 series supports the data (TXD or SD) transmission and control to improve the capability to adapt to different software and simplify the control method. Fiber optic MODEM supports several fibre-optic methods between the asynchronous serial ports and the communication distance may, at maximum, reach the multimode 4KM. The maximum transmission rate of the RS-232 signal is 115.2KBPS and the interfaces with different electrical standards can be mixed. It is unnecessary to connect the power source externally, since it is driven by the unique “RS-232 charge pump” and power is supplied without depending upon the initialized RS-232 serial port. The automatic receiving-transmission switching for the zero time delay is available inside it and the unique I/O electric circuit is used to control the direction of data flow automatically without requiring any handshaking signal (such as RTS and DTR), so as to guarantee the program written under the mode of RS-232 half-duplex and offer the excellent EMI/RFT properties. AOBO 10011 series support the transmission of two data signals: sending data and receiving data. RS-232 and fiber optic are connected via DB9 female head and two ST interfaces respectively and this series can be dismantled and installed conveniently. AOBO 10011 series of passive serial port-fiber modules use two separated optical transmitter and receiver and the optical wavelength is 850nm (multi-mode). The standard ST interface is employed for the transmission and reception. Almost all the multi-mode fiber-optic cables with any dimension can be used, including: 50/125um, 100/140um, 200um. Under the point-to-point state, two pieces of fibers should be used for 2 fiber optic MODEM. The data transmission direction of two pieces of fibers is opposite to each other. 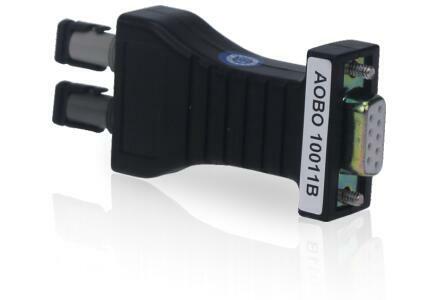 Note: AOBO 10011 industrial passive serial port fiber converter supports 1 RS232 interface (DB9 female head/3-wire) and 1 ST optical interface. The optical interface uses the 850nm multi-mode.